With another Monday in our midst and Mercury in retrograde since April 20th, I need all the positive reinforcements I can get. Usually this takes the shape of a big ole' glass of vino and saying my prayers at the end of the day , but being the firm believer in there-ain't-no-such-thing-as-happenstance and the big zodiac fan (have you checked your May forecast yet?) that I am, I always welcome new hypotheses for my mood and its mysterious ways. So I considered by interest officially sparked when I learned of Eight Moons, a jewelry brand whose designs are premised on the notion that when placed near the body, certain gemstones can draw out negative energy. While I had previously heard of crystal healing therapy, I admit I hadn't given it much thought. Luckily there are others that (for centuries) have and believe in the ability of crystals to assist in releasing mental, physical and spiritual blockages. Yes, it's one of those things that doesn't have any scientific evidence to back it up - but (if you think like I do), don't most of the best things reside in that gray, unprovable domain where the rest of life's mysteries hang out? The stones are powerful - if not for their metaphysical properties, for their simple, organic beauty. Rose Quartz is associated with love, Citrine & Moonstone with focus and success, and Amethyst and Smoky Quartz with dispelling negative energy. The variants in color created by the shadows and grooves of each crystal are something only the likes of Erdem, Gucci, and H&M (say what?!) jacquard could emulate - hence, the outfits du jour. My take on the whole crystal craze? It's a don't knock it 'til ya try it sorta thing - if only because in the case of Eight Moons, trying it means you get some beautiful and eclectic pieces to wear. Not to mention we could all use some extra love, clarity & good vibes. 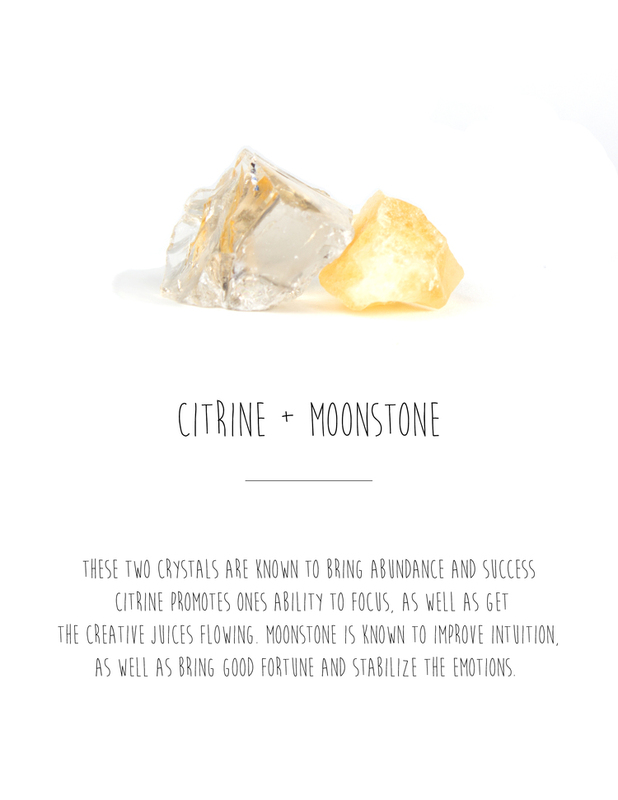 Today, I'm getting by with a little help of Citrine & Moonstone - my mind is positively centered and focused on the goal: happy hour in T minus 3.